The South African Radio League (SARL) has issued the following bulletin about the company SunSpace which developed out of the Stellenbosch University SUNSAT OSCAR-35 project and was responsible for building the SumbandilaSat OSCAR-67 satellite. Both SUNSAT and SumbandilaSat carried amateur radio transponders. SunSpace is getting a new home, well at least the company’s intellectual property and 80% of the staff. The Minister of Science and Technology, Derek Hanekom alluded to solution for the ailing company in his budget speech on 21 May 2013. He announced that the majority of SunSpace’s creditors have accepted the Department’s offer of R55 million for the institutions intellectual property and tangible assets. This decision was recommended in a business rescue plan compiled by a practitioner appointed by the SunSpace Board. The offer was made on the basis of an independent evaluation of SunSpace’s intellectual property and tangible assets. The offer is in line with a Cabinet decision that the satellite manufacturing company be absorbed into the South African National Space Agency (SANSA). SANSA has entered into an agreement with Denel Dynamics to house the SunSpace capability. As part of a process of absorbing SunSpace’s capability within an appropriate entity, the company’s employees have been offered employment in the new business unit, and most of them (more than 80%) have accepted the offer thus ensuring that key capabilities are retained. In this way, South Africa will retain the critical home-grown capacity developed by SunSpace. SunSpace is the outflow of the Stellenbosch University SUNSAT project, South Africa’s and Africa’s first satellite launched on 23 February 1999 on Boeing-Delta II rocket from the Vandenberg Airforce base in California. SunSat was developed and built by post graduate students and lectures. The group built SumbandilaSat for the Department of Science and Technology in record time but it took several years before it was launched. 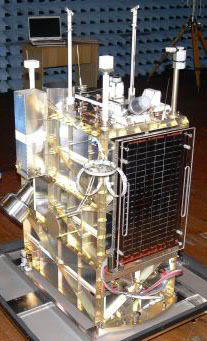 Both SunSat and SumbandilaSat had amateur radio transponders as part of their payload. Denel is no newcomer to space. The company was involved in the previous programme until 1996 and has maintained its space capability including key staff as well as the Houwteq satellite test facility near Grabouw. “This opportunity will allow Denel to optimise the synergy between the SunSpace capabilities and its own capability for broader national technological benefit,” said the Group CEO of Denel, Mr Riaz Saloojee.